Whether they live in a Bush village, a small town, or the big city, Alaskan kids share one thing in common: the heater vent. There's nothing like toasty forced air to warm your toes on a chilly winter morning. My sister and I had only one option—a big grate on the floor that covered the furnace ducting below. We'd stand on it like innocent Marilyn Monroes, letting the warm air billow up under our nightgowns. 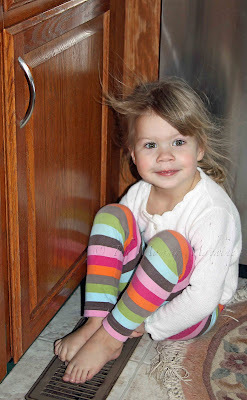 My children benefit from a more opulent lifestyle; our house has a small heater vent in each room, and the girls have chosen the cozy corner in the kitchen as their favorite spot. I never lived in Alaska, but remember getting a small blanket and curling up over the heater vents on winter mornings. Best way to stay warm. Our girls always came upstairs from their downstairs cold bedrooms with their school clothes and dressed by the woodstove in the mornings. . . and jockeyed for the closest and warmest spot. In Texas, our vents are in the ceiling. I guess cause we use the air conditioner 9 months of the year and the heater only three. Sometimes, we use both in one day. Adorable picture, must be keeping her toes toasty.